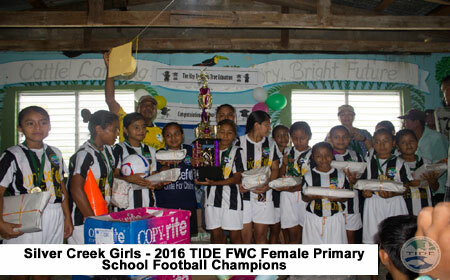 PUNTA GORDA, Wed. June 22, 2016–Today, Wednesday, June 22, at the Cattle Landing Village Football Field, female and male championship games were played in the TIDE Primary Schools Freshwater Cup (FWC) 2016 football tournament. In the female championship game at 9:45 a.m., Silver Creek School Girls won, 2-0, over Trio Primary School Girls, with Annetta Bah (12’ & 27’) scoring both goals for Silver Creek. Silver Creek Girls are therefore the 2016 TIDE Freshwater Cup Primary School Female Football Champions. And in the male championship final that followed, Golden Stream Boys were victorious, 2-1, over St. Peter Claver School Boys. Valeriano Ack (5’) and Samuel Itch (10’) shook the net for Golden Stream, while Ian Selgado (16’) got the lone goal for St. Peter Claver. Golden Stream Boys thus became the 2016 TIDE Freshwater Cup Primary School Male Football Champions. 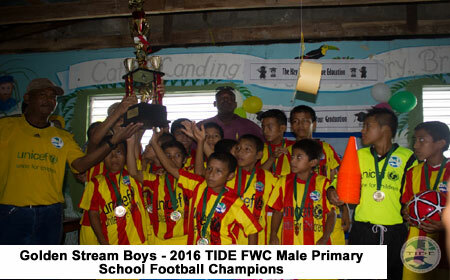 The TIDE FWC Finals ended with championship awards being issued to Silver Creek Primary School Girls and Golden Stream Primary School Boys. NOTE: For more info: Contact Norman Budna, (661-0924), Environmental Outreach Coordinator (TIDE).